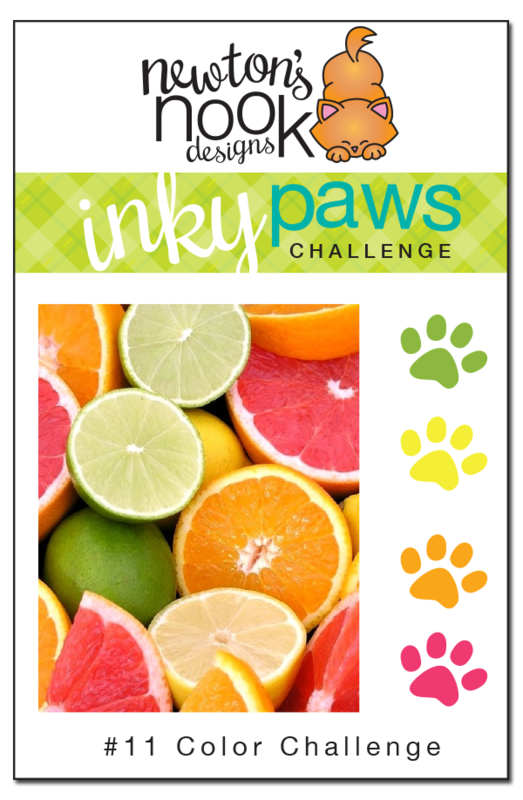 Newton's Nook Designs: Inky Paws #11 Challenge - WINNERS! Inky Paws #11 Challenge - WINNERS! Thanks so much to everyone who entered our last Inky Paws Challenge at here at the Newton's Nook Designs blog! This months theme was a Bright Citrus color Challenge! It looked like everyone had a ton of fun creating bright citrus toned cards! Great job & thanks to everyone who played along! Since we had over 15 participants we got to pick TWO winners! Read the captions below the photos to see who made the cards! Our first winner is this fun striped card by Marina! We love how she created fun stripes using the colors in our color palette with the fun squiggle border and food from our Love à la Carte stamp set! You can see more of her work and congratulate Marina on her blog, Marina's Craft Space. Our second winner also used a stripe in her card! This card is by Yukari! We loved the clean and simple style of this card mixed with the bright citrus colored gifts! 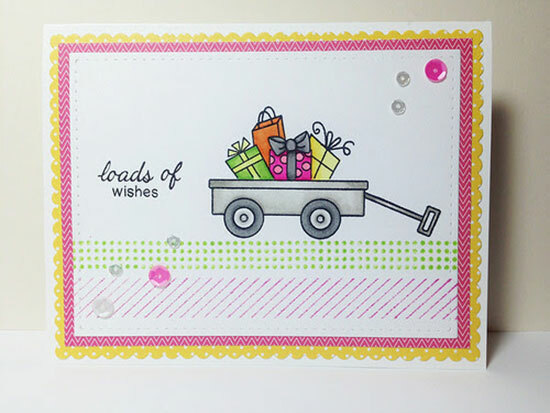 She used our Wagon of Wishes stamp set. You can see cute creations by Yukari on her flickr page. Congrats Marina and Yukari!! Don't forget to send us an e-mail at info@newtonsnookdesigns.com to claim your $10 store credit and get your winner badge for your blog! Since there were so many beautiful cards, we chose three more as our favorite picks! If you see your card below, contact us if you'd like to get a "favorite" badge for your blog! 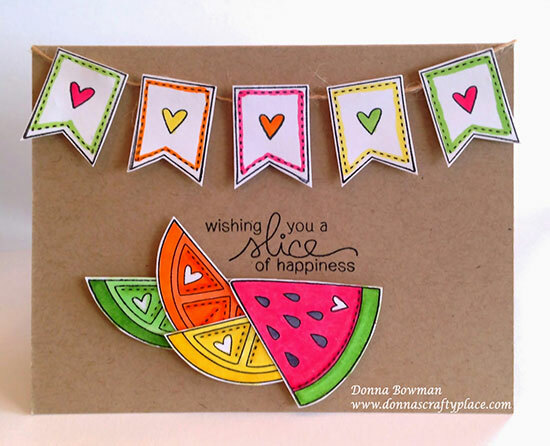 Love the bright- almost neon colors on this card by Donna using our Sweet Summer Stamp set! 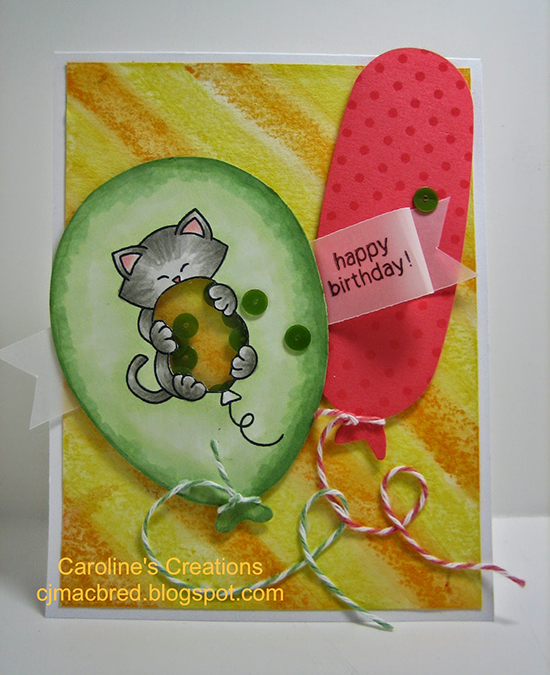 This card by Caroline using Newton's Birthday Bash really caught our eye with the "shaker" inside the kitty balloon! 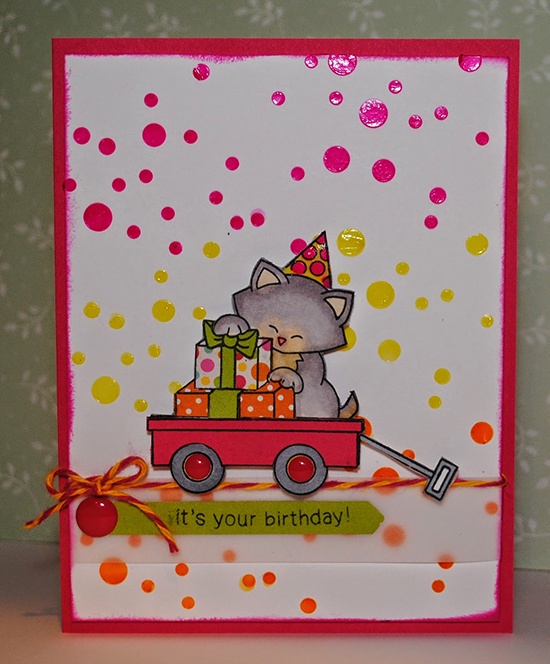 The citrus colors in dotted background are so fun on this card by Indy using Newton's Birthday Bash and Wagon of Wishes sets! Thanks again to everyone who entered - It's really so much fun to look through all the entries and see everyones ideas! If you didn't win this time we hope you'll try again next month. The new challenge will be posted on Friday, July 25. Congrats to all! Such beautiful cards! Still wishing you had a random prize for those of us who are less talented/less creative but still put in the effort. Woohoo thanks so much :)!! Congrats to everyone else too, they're all such pretty cards! Thank you!! These are all great cards. Can't wait to get more of your stamps!! Thanks for picking my shaker card as a favorite. There were so many great projects with that summery colour palette! Congrats to all the winners; a gallery of inspiration, indeed! Surf's Up with Danielle Pandeline! Tickled pink Flamingo card with Streamers! Cool Cat Beach card with Lydia Brooke! Light up your day with Stephanie Muzzulin! Anniversary Blog Hop with Newton's Nook Designs! NND July Release - Day 3 - Flirty Flamingos! NND July Release - Day 2 - Beach Party! Cat Frenzy with Taheerah Atchia! Oranges and Pears that will make you smile! More Inky Paws Inspiration from Samantha Mann! Sweet wishes for the 4th of July! A slice of Happiness with Tessa Wise! Two Fruity Fun Cards with Crafty Math-Chick!